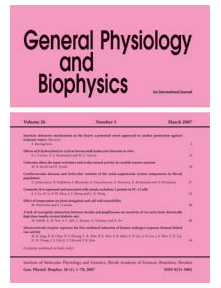 Abstract: S100A1 is a Ca2+-binding protein and predominantly expressed in the heart. We have generated a mouse line of S100A1 deficiency by gene trap mutagenesis to investigate the impact of S100A1 ablation on heart function. Electrocardiogram recordings revealed that after β-adrenergic stimulation S100A1-deficient mice had prolonged QT, QTc and ST intervals and intraventricular conduction disturbances reminiscent of 2 : 1 bundle branch block. In order to identify genes affected by the loss of S100A1, we profiled the mutant and wild type cardiac transcriptomes by gene array analysis. The expression of several genes functioning to the electrical activity of the heart were found to be significantly altered. Although the default prediction would be that mRNA and protein levels are highly correlated, comprehensive immunoblot analyses of salient up- or down-regulated candidate genes of any cellular network revealed no significant changes on protein level. Taken together, we found that S100A1 deficiency results in cardiac repolarization delay and alternating ventricular conduction defects in response to sympathetic activation accompanied by a significantly different transcriptional regulation.